Turnbull and his government have also correctly identified energy storage as key to supporting high system reliability. Wind and solar are intermittent sources of generation, and while we are getting better at forecasting wind and sunshine on time scales from seconds to weeks, storage is nevertheless necessary to deliver the right balance between supply and demand for high penetration of wind and PV. Storage becomes important once the variable renewable energy component of electricity production rises above 50%. Australia currently sources about 18% of its electricity from renewables – hydroelectricity in the Snowy Mountains and Tasmania, wind energy and the ever-growing number of rooftop PV installations. Meanwhile, in South Australia renewable energy is already at around 50% – mostly wind and PV – and so this state now has a potential economic opportunity to add energy storage to the grid. To help realise this potential, in South Australia and elsewhere, the Clean Energy Finance Corporation (CEFC) and the Australian Renewable Energy Agency (ARENA) will spend A$20 million of public funds on helping flexible capacity and large-scale energy storage projects become commercially viable, including pumped hydro and batteries. PHES constitutes 97% of worldwide electricity storage. The retail market for household storage batteries such as Tesla’s Powerwall is growing, but large-scale storage batteries are still much more expensive than PHES. “Off-river” pumped hydro has a bright future in Australia and many other countries, because there are very many suitable sites. Wind and PV are the overwhelming winners in terms of new low-emissions electricity generation because they cost less than the alternatives. Indeed, PV and wind constituted half of the world’s new generation capacity installed in 2015 and nearly all new generation capacity installed in Australia. Recently, we modelled the National Electricity Market (NEM) for a 100% renewable energy scenario. In this scenario wind and PV provide 90% of annual electricity, with existing hydro and bioenergy providing the balance. In our modelling, we avoid heroic assumptions about future technology development, by only including technology that has already been deployed in quantities greater than 100 gigawatts – namely wind, PV and PHES. Reliable, up-to-date pricing is available for these technologies, and our cost estimates are more robust than for models that utilise technology deployment and cost reduction projections that are far different from today’s reality. In our modelling, we use historical data for wind, sun and demand for every hour of the years 2006-10. Very wide distribution of PV and wind across the network reduces supply shortfalls by taking advantage of different weather systems. Energy balance between supply and demand is maintained by adding sufficient PHES, high-voltage transmission capacity and excess wind and PV capacity. The key outcome of our work is that the extra cost of balancing renewable energy supply with demand on an hourly, rather than annual, basis is modest: A$25-30 per megawatt-hour (MWh). Importantly, this cost is an upper bound, because we have not factored in the use of demand management or batteries to smooth out supply and demand even more. What’s more, a large fraction of this estimated cost relates to periods of several successive days of overcast and windless weather, which occur only once every few years. We could make substantial further reductions through contractual load shedding, the occasional use of legacy coal and gas generators to charge PHES reservoirs, and managing the charging times of batteries in electric cars. Using 2016 prices prevailing in Australia, we estimate that the levelised cost of energy in a 100% renewable energy future, including the cost of hourly balancing, is A$93 per MWh. The cost of wind and PV continues to fall rapidly, and so after 2020 this price is likely to be around AU$75 per MWh. Crucially, this is comparable with the corresponding estimated figure for a new supercritical black coal power station in Australia, which has been put at A$80 per MWh. Meanwhile, a system developed around wind, PV and PHES and existing hydro can deliver the same reliability as today’s network. PHES can also deliver many of the services that enable a reliable energy system today: excellent inertial energy, spinning reserve, rapid start, black start capability, voltage regulation and frequency control. Australia’s fossil fuel fleet is ageing. A good example is the pending closure of the 49-year-old Hazelwood brown coal power station in Victoria’s Latrobe Valley. An ACIL Allen report to the Australian Government lists the technical lifetime of each power station, and shows that two-thirds of Australia’s fossil fuel generation capacity will reach the end of its technical lifetime over the next two decades. The practical choices for replacing these plants are fossil fuels (coal and gas) or existing large-scale renewables (wind and PV). Renewables are already economically competitive, and will be clearly cheaper by 2030. Energy-related greenhouse gas emissions constitute about 84% of Australia’s total. Electricity generation, land transport, and heating in urban areas comprise 55% of total emissions. Conversion of these three energy functions to renewable energy is easier than for other components of the energy system. Transport and urban heating can be electrified by deploying electric vehicles and heat pumps, respectively. Electric heat pumps are already providing strong competition for natural gas in the space and water heating markets. Importantly, these devices have large-scale storage in the form of batteries in vehicles, and thermal inertia in water and buildings. Well-integrated adoption of these technology changes will help reduce electricity prices further. So wind, PV and PHES together yield reliability and affordability to match the current electricity system. In addition, they facilitate deep cuts to emissions at low cost that can go far beyond Australia’s existing climate target. 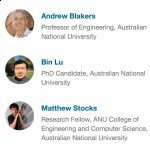 This entry was posted in Climate change, Economics, Environment, Renewable Energy, Technology and tagged climate change, economics, environment, politics, renewable energy, solar power, sustainability by Andrew Blakers, Bin Lu & Matthew Stocks. Bookmark the permalink. Does solar make a difference? Apart from the ‘feelgood factor’ does solar really make that much of a difference? Most solar electricity is produced around the middle of the day which pushes down wholesale electricity prices and hurts the big carbon emitting power generators, but solar doesn’t help much at the peak demand period for electricity in the late afternoon and early evening. Power grids require that demand for electricity matches supply in order to function. This is an enormous problem for wind and solar power since their output cannot be accurately predicted in advance or easily adjusted. Wind and solar can burn out the grid if they produce too much, or not enough, electricity, leading to brownouts or blackouts. Such damage has already occurred in Germany and in other grids that rely too much on solar and wind power like in California, and the blackouts (load shedding) experienced in Australia last week. Germany has been minimising the damage by paying consumers to take excess power and asking Wind & Solar producers to switch off when they’re not needed. Germany paid wind farms $548 million last year to switch off in order to prevent damage to the country’s electric grid. Due to the damaging effects green energy has had on Germany’s grid, the government plans to cap the total amount of wind energy at 40 to 45% of national capacity, according to a report published last month by the German newspaper Berliner Zeitung. By 2019, Germany will get rid of 6,000 MW of wind power capacity. The USA’s FERC is currently investigating how green energy undermines the reliability of the electrical grid. Wind & Solar also run the risk of not producing enough electricity, grid operators have to keep excess conventional power reserves running just in case. Power demand is relatively predictable over time and conventional power plans, like Gen IV SMR nuclear plants and natural gas, can easily adjust output. Do you have any solution to prevent the possible blackout in the future?